Some cinemas were forced to close during World War One when key staff were called up for war service. Others served a useful function in conveying war news, entertaining troops stationed nearby, and raising money for war charities. Feature-length films took over from shorts. Major attractions such as the Italian epic Cabiria (d. Giovanni Pastroni, 1914) and the American productions The Birth of a Nation (d. D.W. Griffith, 1915) and Intolerance (d. D.W. Griffith, 1916) tended to be shown first in live theatres with their larger capacities, where they would be reviewed by the press and presented in separate performances for long runs, with seats bookable in advance at higher prices, before filtering down to ordinary cinemas. By 1917 cinemagoing was so firmly established that it came under the scrutiny of the National Council of Public Morals. Some alleged that films encouraged juvenile crime, the spread of disease and indecent behaviour in the dark, but it was conceded that the cinema countered the attraction of the public house. There was considerable opposition to cinemas opening on Sundays, prompted by the threat to church attendances. Although the King and Queen had viewed Quo Vadis? (Italy, d. Enrico Guazzoni, 1912) at the Albert Hall, they paid their first official visit to the cinema to see the British naval epic Zeebrugge (d. A.V. Bramble/H. Bruce Woolfe, 1924) at the Marble Arch Pavilion and attended a special performance there of another patriotic drama, The Flag Lieutenant (d. Maurice Elvey, 1926). When cinema construction resumed some years after the end of the War, vast new picture palaces began to appear in major cities, influenced by the styles developed in the United States. The first of these was for PCT: the now demolished Regent at Brighton (1921), seating 2,200 with restaurant, café, tea room and a huge ballroom above the auditorium. Others included the Elite Nottingham (1921), Piccadilly Manchester (1922), Majestic Leeds (1922) and Pavilion Shepherd's Bush, London (1923). These usually featured full orchestras to accompany the silent films as well as organs. 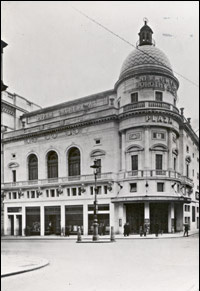 This was a difficult period for the cinema, with temporary setbacks caused by a flu epidemic, unemployment and the advent of radio, but full confidence seemed to return as a major wave of new cinema construction began around 1926 and resulted in some of the largest cinemas ever built in this country. In Glasgow, Green's Playhouse opened in 1927 with 4,254 seats, the largest total for a single cinema auditorium in Britain. Two American film companies, Paramount and Metro-Goldwyn-Mayer, commissioned their own large premiere outlets in the West End of London: the Plaza and Empire respectively. PCT built a series of opulent Regents and New Victorias in London and various provincial cities - these were mostly in neo-classical style, but the London New Victoria (1930) introduced a German-inspired underwater fantasy theme of a 'mermaid's palace'. 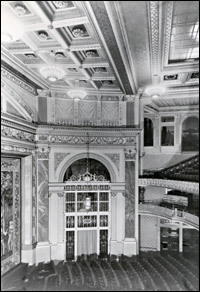 Similar fantasy settings were featured in British examples of the American 'atmospheric' style in which the audience was seated in an outdoor setting with the ceiling representing a starry sky. Created on the side walls and around the proscenium arch, the interior décor was like a giant stage set, and could suggest an Italian garden or a Moorish village. The Astorias in the London suburbs of Brixton (1929) and Finsbury Park (1930) were the most elaborate British atmospherics. In the 'silent' period, there was no barrier to major foreign films such as Metropolis (Germany, d. Fritz Lang, 1926) being widely shown, as it was comparatively simple to insert English intertitles to replace those in the original language. The Film Society was established in London in 1925 and showed Russian films banned for their political content, revived old classics and imported new foreign films of artistic interest to show to its members. It was the forerunner of the 'art house'. The sound revolution reached Britain in September 1928 when the part-talkie The Jazz Singer (US, d. Alan Crosland, 1927) was presented in London. However, it was the sensational success of The Singing Fool (US, d. Lloyd Bacon, 1928), which opened two months later, that really established talking pictures in this country. The first British production to make an impact with sound was Blackmail (d. Alfred Hitchcock, 1929). Leading financiers began to take an interest in the film industry and a merchant bank promoted the Gaumont-British Picture Corporation in 1927, a new combine amalgamating existing companies in film production, distribution and exhibition, and intent on expansion (it soon took over PCT). In 1928, British International Pictures established Associated British Cinemas by merging existing circuits, eventually becoming the Associated British Picture Corporation.